This was my first guided, hunt, and what a amazing adventure! The spike camp was warm, dry and extremely comfortable. On Day 3, Jeremy and I found the enormous skull you see hanging. We heard several bulls on this trip. But there was one in particular that had our attention. On the 23rd, Jeremy was in a calling battle for over an hour. Just as we lost light, he stopped, never showing himself. We strategized and talked about him being related to the behemoth hanging outside. Our last evening did not start as planned. There were no answers to our calls. After more than an hour of silence, he grunted! Jeremy seduced him out on the shore and with one shot, he fell down! A giant bull spanning 45"-51" with lots of character; 21 points including a drop tine! Thank you Jeremy, and Thank you Vince!! I Gerard “Jerry” Devine of Leraysville, PA would like to take the opportunity to thank Vince Cocciolo and Total Outdoor Adventures LTD for enabling me to fulfill my dream of taking a lynx with hounds. I arrived on Sunday, November 26 th 2017 at Prince George in Northern British Columbia. I then met with my guide Jacob Blair and we proceeded to travel to Bear Lake. On day one of my hunt, Monday the 27th, we cut five different lynx tracks and dropped the dogs, while trying to get ahead of the dogs we came upon a really fresh set of running lynx tracks. We dropped one dog and that chase was on. We both thought it was the first lynx and waited for the other dogs…We were wrong!! Two different chases! Jacob and I decided to pull the dogs off of the first chase. We then tried to get in front of the other chase. After two hours, the lynx was treed but in a place only accessible by snow machine, After another few hours we were able to get the snowmobiles close to the tree and unfortunately the lynx jumped and we pulled “Oakley” the lead dog off as it was getting too late in the day. What a First Day!! On the second day of my hunt we cut two fresh tracks. The snow was rather deep, so Jacob put two dogs on the track. The chase ended up in a thick swamp. The dogs had a very tough time as the lynx made circle as circle. We moved in and pulled the dogs off. On the third day was uneventful as conditions were tougher with no fresh snow and no tracks were fresh enough to run. A rest day for the dogs. Day four greeted Jacob and I with a fresh snow fall. It took very little and we cut a very fresh track. The chase was on! After five hours, and over ten miles, the dog was making tight circles about 600 metres from the road. We started for the dog, knowing the lynx had to be somewhere near where the dog was circling. Jacob got to the location first and spotted the lynx treed. I arrived shortly after and figured the lynx to be about 50 feet above us porched on a limb. One well-placed shot with a 22 magnum and my quest to take a lynx with hounds was fulfilled. I also want to acknowledge Jacob’s Helper Stacey Beard, who helped all around our accommodations. His outdoor knowledge and experience were only surpassed by his culinary skills. I again want to thank Vince Cocciolo and Jacob Blair for some of the best four days of my hunting life. Least but not forgotten a huge thanks Oakley, Buster, Sam, Luna, Trump and Blaze for making this all possible! My buddy and I had a great time with Total Outdoor Adventures in their Bull River region. The area has breath taking views everywhere you look. The main lodge has all the amenities to make your hunt comfortable including showers, central heating and WiFi. They have set up a network of spike cabins equip with bunks, cooking utensils and wood stoves which are all a few hours ride off the main access road. There was no shortage of mountain goats in the area. We saw 10 to 15 per day and where both able to fill our tags with trophy Billy’s. We also where able to fill a wolf tag each and I shot a black bear. The guides where all hardworking and professional. If your looking for a extreme goat hunt in one of the most beautiful spots I have ever hunted then Bull River region with Total Outdoor Adventures is the spot to book. Hunting Southeastern British Columbia with Total Outdoor Adventure was one word, AMAZING! I have lived in Oregon, Idaho and Utah over the past 10 years and have hunted all 3 places in addition to Nevada, Wyoming and Colorado. I can honestly say, that hands down, Southeastern British Columbia and TOA has the best game quality and quantity that I have ever experienced. Couple that with incredible lodging, property and an outstanding guide, I couldn’t have asked for anything more. I had 2 Black Bear tags that I filled by day 3. My guide and I saw 14 plus black bears ranging in color from black, brown, cinnamon and blonde. Not to mention the 5 Grizzly, 7 Shiras Moose, 2 MTN Goats, and hundreds of Elk and Deer. Total Outdoor Adventure saw to every detail of the hunt. Vince even went as far as to contact the taxidermist on my behalf and have him come out to the camp to go over the different options. I was so impressed with the TOA operation, animals etc that I booked a Trophy Bull Elk hunt before leaving camp. 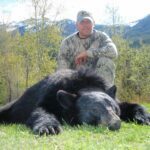 I have hunted with TOA for bear, elk, shiras moose and mt lion and have been successful on every hunt. Vince and his staff have provided a quality experience in every aspect from food, facilities, horses, hounds, and guides. His territories are alive with game. On each hunt I have seen large numbers of animals. on the moose hunt, we saw 4 moose while packing into the spike camp! We hadn’t even started hunting yet! We were able to look at over 10 moose before making our plan on the 48″ plus double brow tine moose that is hanging on my wall. My Elk was called and coaxed in to 47 yards in an exciting conversation between the guide and the animal. But by far the most exciting and intense hunt for me was the mt. lion hunt we just completed ( view picture in photo gallery). Vince’s hounds are incredible and shooting a 170 lb mountain lion at 8 yards as it was coming back down the tree to attack the dogs was an unbelievable experience. I’m still looking forward to mountain goat, grizzly bear and another elk and black bear hunt. There is absolutely no doubt that I will be hunting these animals with Vince and TOA. A few months have passed since my cougar hunt this past December with Total Outdoor Adventures. Often I think of how blessed I am with good health and the ability to get away from the business from time to time. I work hard to have a few extra dollars to spend on the things I truly enjoy and look forward too. I want to send a big thanks to TOA and my guide Nathan Kelly for making my hunt such a memorable experience! Lack of good snow made for challenging conditions and finding tracks of any kind difficult. I just wanted to send a big thanks to Total Outdoor Adventures and my guide Nathan Kelly for a very quality Mt. Lion hunt I had the pleasure of being a part of this past January of 2016. Although we struggled to find tracks due to cold temperatures and slow movement of cats, I was kept focused and optimistic thanks to my guide!! Even though we succeeded in treeing a big female part way thru the week I decided to pass and try for a tom after much indecisiveness Nate helped persuade me that this was the right decision. Nathan stayed consistent in his efforts with me and the adventures we had in those eight days helped keep me positive and optimistic that we would prevail. Midway through the last day of our hunt I conceded to the fact that I would probably have to return to achieve my goal. I had no problem with that because Nate gave 110% in his hunting efforts throughout the week. I was already excited to return and have to do it all over again with him. Nate was relentless in his efforts to find tracks and low and behold with only 4 hours of daylight left we found a track worth pursuing. This was the cat we had been looking for!! I was so confident in his excitement that I almost couldn’t hold it together. His words over the last couple days stuck in my head “it’s not over till it’s over Russ and even then its still not over ;)” With the use of TOA’s snowmobiles we got the hounds to the track and the chase was on ☺ I was presented an opportunity to harvest a beautiful trophy Mt.Lion with darkness upon us. I was filled with excitement but was still able to make a clean shot with my bow. I experienced one hell of a hunt for 8 full days. On my way home I was extremely glad to have had the honor of harvesting such a magnificent trophy but at the same token was disappointed that I wouldn’t have to return to hunt next winter… I’ve been on many hunts throughout my 58 years and this was one that will always keep me smiling! I was fortunate enough to watch my son take a great bull elk several years before this hunt with TOA and will be in contact soon for I will pick another species to hunt with Total Outdoor Adventures. Until then, thank you and tell Nate I will be back !!! I hunted Mountain Goat with TOA in British Columbia and Nathan Kelly as my guide. It was an awesome experience and we succeeded in taking a mature trophy billy!! Nate knows the areas he hunts well and is able to make his way around in the mountains better than anyone I have previously hunted with. While he is able to scale mountains with seeming ease, he can also take hunters that can’t climb as easily as he can. I was 69 years old when we hunted and he accommodated my pace very well. If you want to take a trophy goat, sheep or any other game in British Columbia, TOA is a great outfit and Nate Kelly is the man to go with.